The counts of Sternberg are one of the most important Czech noble families and descend from Diviš z Divišova who died after 1130. 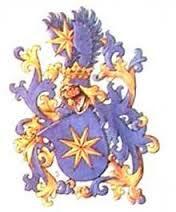 His descendant Zdeslav (+ 1265) is the first to use the name Sternberk (Sternberg). Adam Sternberk (+ 1560) was High Chamberlain of Bohemia since 1554. Male members of the family were created Graf in 1661. The elder line of the family became sovereign in Germany after the marriage of Franz Christian Graf v. Sternberg (1732-1811) with Augusta Leopolda Countess of Manderscheid-Blankenheim. Their son Franz lost Blankenheim and Geroldstein to France in 1794. He received in return in 1803 Schüssenried and Weissenau, which was mediatised in 1806 as part of Württemberg. The line however died out with him in 1830. The younger line continued in Bohemia in two branches; Castalovice and Pohorelice. 101. Jane Templeton Cunningham * 1832 + 1888; Dr van James C.